Five of those 25 played less than 10 games, major leaguers Wilson Ramos, Trevor Plouffe, Richie Weeks, and Brad Miller, plus Grant Kay who appeared in four games in late July before going back to Montgomery. Ryan Brett appeared in 12 games, but was essentially on the DL for the entire year. This table sorts players by wOBA (weighted on base average) and includes another stat (wRAA) that compares performance to league averages. 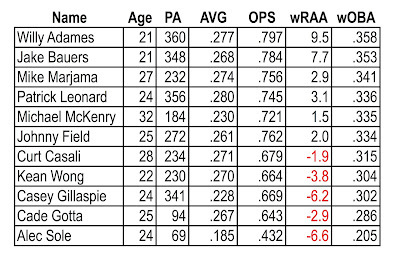 We like wOBA, but as you can see, it pretty much matches the better known OPS over the season. Players are discussed in order of plate appearances. "Slash Line" is Batting Average/On Base Percentage/Slugging Percentage. The Bulls played a 142 game season that ended September 4, 2017. Post-season hitting is not included in these data. Willy Adames (21 years old, 130 games, 578 plate appearances, .277/.360/.415) had a fine year. Only two players (Jake Bauers and Patrick Leonard) played in more games. His 210 total bases led the Bulls. His wOBA was 5th best. His baserunning could have been a bit better, 11 steals, 5 caught stealing. I like his OBP of .360. His team-worst 132 strikeouts is worrisome. But he also had the teams best batting average. Almost all of his games were at shortstop, and he made 24 errors there. All in all, he lived up to his reputation as a leading Rays prospect. Stats. Jake Bauers (21 years old, 132 games, 575 plate appearances, .263/.368/.412) seemed to improve as the year went on, ending up with a terrific wOBA of .352, team best (among regulars) OBP, and 200 total bases. He seemed to blossom after Casey Gillaspie was traded away near the end of the season and he became the every day first baseman. He was a star in the postseason. At just 21 years of age, and not yet on the Rays 40-man he could easily start next year with the Bulls and we'd love to see him back, if only for a month or two. Stats. Johnny Field (25, 111 games, 480 plate appearances, .261/.303/.425) was a huge part of this year's championship team. Especially, it seemed, when he batted leadoff. He led the team in doubles and had 57 RBI, an unusually high number for a leadoff hitter. He had to share some center field duties with Mallex Smith when Smith was in town, but, to be honest, I preferred Field's approach to outfielding and base running. Stats. 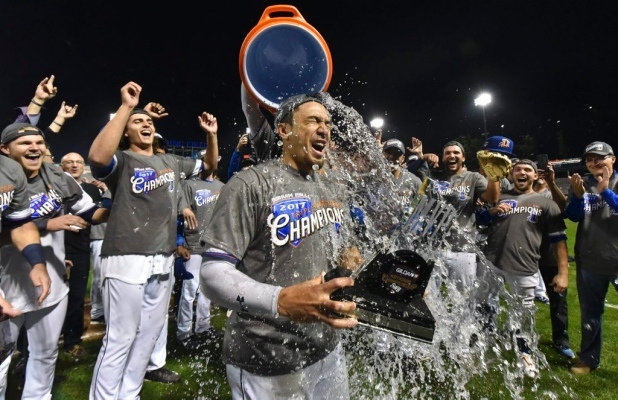 Kean Wong (22, 105 games, 417 plate appearances, .265/.328/.361) was the hero of the national championship game with his grand slam that won the game, but, much more than that, he was a solid member of the "diamond" (catcher, shortstop, second base, center field) virtually all of the year. Wong started with the Bulls, went down to Montgomery for a couple of weeks in May, and came back to stay. He was a very sure-handed second baseman, making only 9 errors at 2B and was part of 58 double plays. Also, he record was in the face of Tampa Bay's radical shifting that can make for some odd accommodations. Lastly, he was always a threat to try bunting for a single. Fun to watch. Hope he comes back. Stats. Casey Gillaspie (24, 95 games, 395 plate appearances, .227/.296/.357) was a star in 2016, but never got on track on 2017. He was traded to the White Sox after 95 games with the Bulls and got in 30 games with the Charlotte Knights before the end of the year. Mostly this year we just kept hoping that whatever ailed him would go away, but it never did. Maybe a new context is what he needed. Stats. Curt Casali (28, 85 games, 343 plate appearances, .263/.351/.347) had the most game appearances of the five catchers that were on the Bulls roster this year. He caught in 53 games and DH'd the rest. A fan in the stands really can't tell how much a catcher is contributing to the cause beyond the numbers. That is, how good a game is he calling? How well is he managing young pitchers? Certainly, he got a lot of playing time among a large crew of catchers. He was called up in early September, so missed the Bulls playoffs. He had limited time on the field with the Rays, although he did hit a home run on the last game of the Rays season. Stats. Shane Peterson (29, 76 games, 300 plate appearances, .286/.313/.504) started the season with the Bulls, but went up to the Rays after a few games and spent the rest of April there. He came back for much of May and June, spent July with the Rays, and August with the Bulls. As a Bull, he was an exceptionally valuable left-hand bat. He carried best OPS among those who might be considered a "regular" this year and complemented the key "diamond" players mentioned above very, very well. To my surprise, he did not get called back to the Rays in September. In the playoffs, he was in the lineup of every game as the designated hitter or in the outfield and did a fine job. Would be happy to have him back in a Bulls uniform. Stats. Mike Marjama (27, 72 games, 292 plate appearances, .274/.342/.445) was this year's poster child for the Rays system's inability to manage/develop catchers effectively. He was doing better than just fine when he was traded to Seattle in early August. We wish him well and we're pleased to see he got his "cup of coffee" with the Mariners in September. I expect to see him join all the other ex-Rays catchers who have made it to ML playoffs with another team. Stats. Jake Hager (24, 73 games, 291 PA, .229/.275/.328) never quite hit his stride this year. He ended up with almost exactly the same amount of playing time as in 2016, when he made his AAA debut. And he was competing among a very talented group of infielders. He spent some time on the disabled list this year, which didn't help. He's a good ballplayer. Maybe next year. Stats. Michael McKenry (32, 73 games, 272 PA, .209/.338/.324) was this year's "veteran" presence. At a guess, he was brought in to be a back-up catcher, but ended up being used in the outfield (25 games) and DHing (23 games) as much as catching (24 games). Not to mention time at 2B (1), 3B (1), and 3 relief appearances. He had two starts in the post-season, both at catcher. Stats. Mallex Smith (24, 45 games, 205 PA, .263/.325/.392) started the season with the Rays, came to the Bulls for May and early June, went up to the Rays for June and July, and spent late August with the Bulls. From the stands it sure seemed like his contribution to the Bulls was mixed. Yes, he was a good ballplayer, but his speed seemed to confuse the Bulls as much as it did the opposition. He stole 21 bases, but was caught 8 times. His speed earned him 4 triples. When in town, he usually played center field moving Johnny Field to left or sometimes right. The Rays don't seem to have a clear vision of what they want from him. We'll have to see. Stats. Taylor Featherston (27, 31 games, 129 PA, .200/.248/.342) went from the Phillies system to the Rays in early June, then came to the Bulls in mid-July, playing a little bit of everything, 2B-4, SS-3, 3B-7, LF-6, RF-9. At bat, he was not able to make much of a contribution. He played in the first four playoff games as an outfielder, but did not appear in the rest. He elected free agency in October. Stats. Cade Gotta (25, 27 games, 94 PA, .267/.287/.356) had two visits to the Bulls up from the Montgomery Biscuits, in April and in June/July. From the stands, he was an impressive ballplayer with good speed and power. I'd expect him to be with Durham next year. Stats. Dayron Varona (29, 19 games, 77 PA, .268/.325/.479) is the kind of ballplayer that I like. Unfortunately for him, the Rays apparently wanted to make room for their younger outfielders not too long after the season started. Varona's superb slash line was not enough to keep him with the Bulls. He caught on with the York Revolution in the Independent Atlantic League (along with former Bulls Joel Guzman and Alexi Casilla) as an outfielder, where he had a decent year. Stats. Alec Sole (24, 22 games, 76 PA, .183/.237/.197) started the season with the Montgomery Biscuits, went to the Charlotte Stone Crabs for a few games, spent June and early July with the Bulls before going back to the Stone Crabs where he was released in early August. An above-average infielder, he was not able to succeed at bat as a Bull. Stats. Granden Goetzman (24, 17 games, 73 PA, .314/.342/.429) came up from the Montgomery Biscuits very early in the season and went back after 17 games with some fine numbers. Unfortunately, he went on the disabled list there mid-June and never quite came back. He ended the season with the Charlotte Stone Crabs. Stats. Justin O'Conner (25, 20 games, 71 PA, .194/.225/.299) came to the Bulls from the Biscuits in early August. Competing with three other catchers on the Bulls roster, he probably did not get as much playing time as he would have liked. He's is a very promising catcher with a cannon for an arm. He was the regular catcher for the post-season, playing in 7 of the 9 post-season games. Stats. Daniel Robertson (23, 11 games, 47 PA, .372/.426/.488) spent most of 2017 with the Rays. He didn't come to the Bulls until the end of the season and went back to the Rays after the post-season. But he was incredibly helpful in those 11 regular season games and in the 9 post-season games. He started every post-season game at 3B and was the hero of the Governors' Cup championship game with 4 RBIs. Stats. 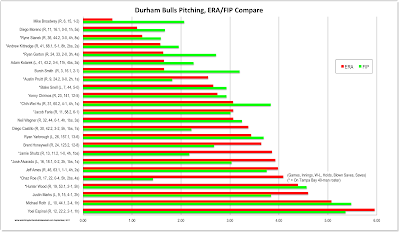 42 different ballplayers pitched for the Durham Bulls this year, up from 34 in 2016, and that was in the regular season. Add a couple more for the postseason run. Of those 42, 3 were position players thrown to the wolves at the end of losing contests: catcher Michael McKenry (3 times for 2 innings and an ERA of 58.50), outfielder Johnny Field (1⅓ innings, ERA: 20.25), and infielder Kean Wong (⅓ inning, ERA: 0.00). 13 of those 42 had less than 10 innings and were a mixture of rehabbing TB pitchers (e.g., Brad Boxberger) and short-term promotions from AA Montgomery. 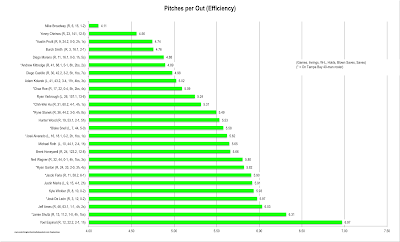 Here are a few charts to get us started, beginning with the number of innings pitched. 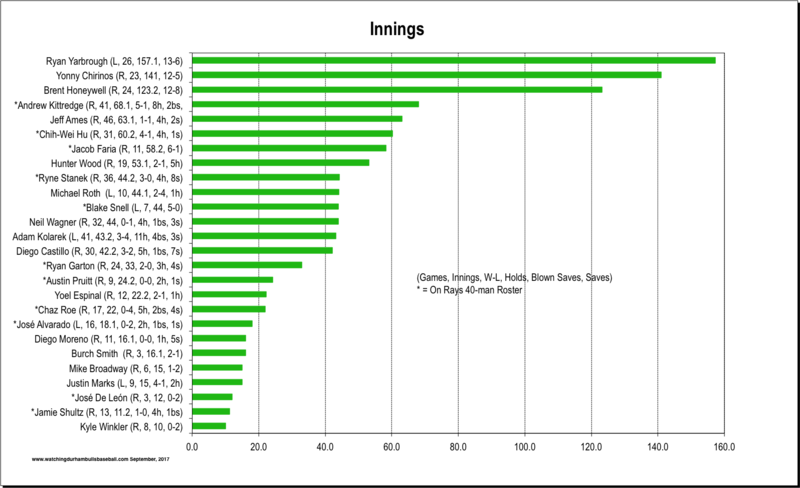 Then here's a look at the ERAs (Earned Run Averages) and FIPs (Fielding Independent Percentages). 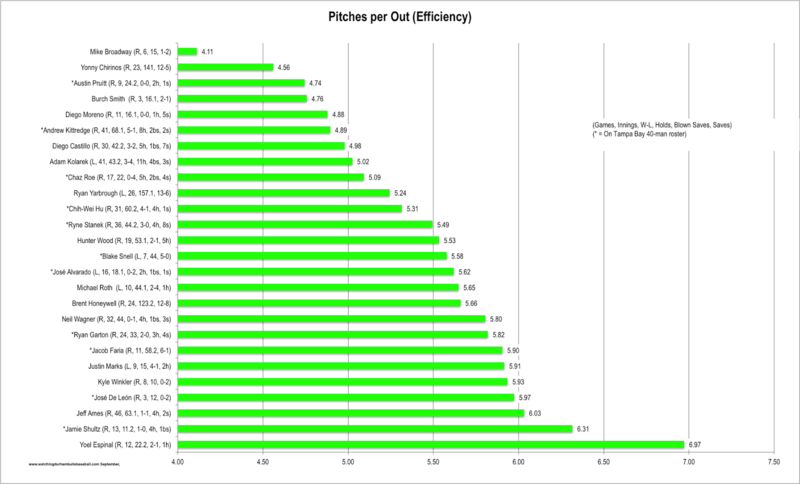 And, lastly, a home-grown measure of "efficiency": Pitches per Out. Note: we had a discussion like this last year and players mention then are marked with a ## that links to that blog post. For a complete roster check this link. List below is sorted by innings pitched. Players on 40-man marked with an asterisk *. Inside the perens: handedness, appearances, innings, won-loss, holds (h), blown saves (bs), saves (s). Ryan Yarbrough (left-handed, 26 appearances, 157.1 innings, 13-6) was the obvious star of the Durham Bulls starters: The most wins, the most starts, most innings, 3rd best ERA (after Chirinos and Snell). He had three starts in the post-season and the Bulls won all three games (although he only got credit for one win). He came to the Rays system out of the Seattle system. At just 25, he should have a big future with the Rays. He's not on the 40-man and has no major league time, so the Bulls might see him back next year. Stats. Yonny Chirinos (R, 23, 141, 12-5) came up from Montgomery in early May and never looked back. At 23 years old he should also have a huge future with the Rays (and the Bulls). In 23 games he had the best ERA of the regular starting crew (see Blake Snell for the exception), the 2nd best "efficiency" rating, and the best WHIP among the starters (a superb 0.98). Plus, as with Yarbrough, he's not on the 40-man. So we could see him again next year. In the post-season he had a win in 2 starts and only gave up one run in 10 innings. Lastly, great fun to watch. Stats. Brent Honeywell (R, 24, 123.2, 12-8) came up from Montgomery in mid-April, so essentially spent all 2017 with the Bulls. In his 24 starts his ERA was just slightly worse (3.64) than Yarbrough — certainly more than respectable. He's also young, just 24. His WHIP of 1.30 is above the team average. And he works pretty hard for his outs (5.56 P/O). However, in the case of a named "prospect" you're never sure if they start each game with an instruction to "work" on something, which in turn skews their stats a bit. Stats. *Andrew Kittredge (R, 41, 68.1, 5-1, 8h, 2bs, 2s) put in a bunch of innings as a reliever in a bunch of games. In fact, he and Adam Kolarek were tied for 2nd place in that category. He carried a stunning ERA of just 1.45, a WHIP of .095, and was extremely efficient at 4.89 pitches per out. He has had 13 innings with the Rays this year (so far — he was called up for the third time in early September). He was a key figure in the superb Bulls bullpen. By the way, he started 2 games as part of the Bulls several "bullpen days". Stats. 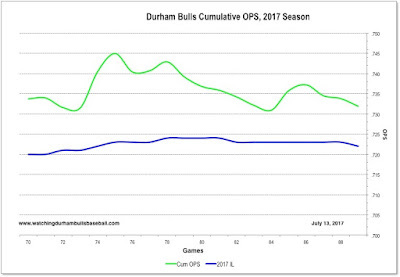 Jeff Ames (R, 46, 63.1, 1-1, 4h, 2s) has numbers that, in my view, understate his importance to the Bulls this year. His ERA of 3.98 wasn't stellar, nor was his WHIP of 1.405. And he certainly wasn't very "efficient" at 6.03 pitches per out. On the other hand, he was always there, ready to put in an inning or two at just about any point in a game. He appeared in five post-season games and did not allow a run (and stranded 4 inherited baserunners). I'm not sure the Bulls would have made it to or through the championships without him. Stats. *Hunter Wood (R, 19, 53.1, 2-1, 5h) did not join the Bulls until mid-June, coming up from Montgomery. He initially went into the starting rotation and did just fine. In late July, however, he was moved to the bullpen for 13 more appearances. Overall, the young (23 years old) seems to need more work. But he sure made a difference in his three short postseason stints (two wins). I've heard he has a high upside in the organization, and that makes sense. 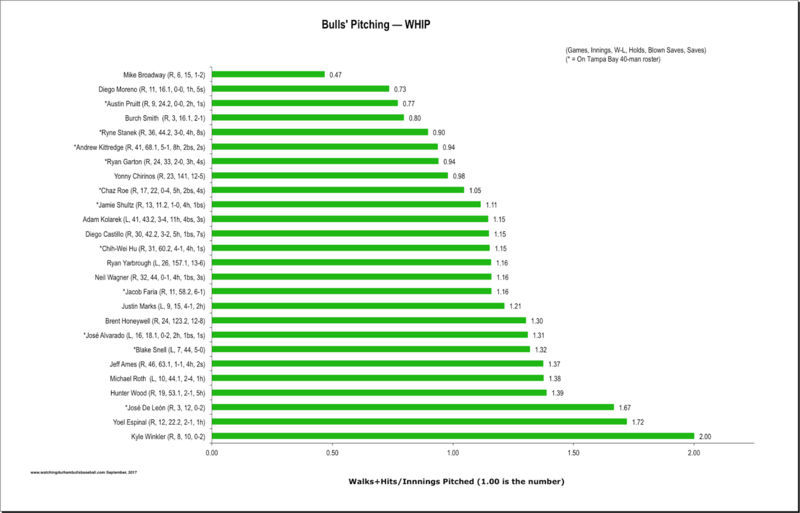 His ERA (4.39), FIP (4.57), and WHIP (1.39) are not particularly impressive, but it's a small sample size. He took an interesting path to the Bulls. He started the year in Montgomery, went up to Tampa Bay for his major league debut at the end of May. Went back to Montgomery for 3 games. Then came to the Bulls. Next year? Probably. Stats. Michael Roth (L, 10, 44.1, 2-4, 1h) came to the Bulls out of the Giants system and Sacremento in the Pacific Coast League. He did not have an auspicious beginning, losing his first three starts. Things were looking better in the next two, but after that, not much. To cap it off, he left the August 24th game with what was reported to be a broken finger and has not been heard from since. Pretty dismal stats: ERA: 5.08, FIP: 5.48, WHIP 1.38. At 27 this might have been his last chance, but then there were those two really good games, and he's left-handed. Stats. Diego Castillo (R, 30, 42.2, 3-2, 5h, 1bs, 7s) made a tremendous difference from the day he arrived up from Montgomery the beginning of June. Even after his numbers got hammered after a disastrous game on the 6th of July (6 runs without an out that blew up his ERA to 5.29), he stayed the course and ended the year with a decent ERA of 3.38, an even better FIP of 2.22, a WHIP of 1.15, and a very efficient P/O of 4.98. The best parts of his performance were the 7 saves, 6 of them coming after the all-star break. And then there was his work in the playoffs — 5 appearances and 3 saves — just brilliant. Plus there's a good chance the 23 year-old will be back with Durham next year. Stats. Yoel Espinal (R, 12, 22.2, 2-1, 1h) had a very odd year. He started with the Charlotte Stone Crabs, jumped to Durham, then to Montgomery, then back to Durham and back to Montgomery, then down to the Gulf Coast Rays, and finally back where he started with the Stone Crabs (A+). At a guess, some potential. Stats. *Chaz Roe (R, 17, 22, 0-4, 5h, 2bs, 4s) came over from the Atlanta system in mid-July. He did OK, but took 4 losses and had two blown saves. He was called up in September and has made 6 appearances in short relief with the Rays. Stats. *José Alvarado (L, 16, 18.1, 0-2, 2h, 1bs, 1s) came down from Tampa Bay near the end of the season, then went back. Diego Moreno (R, 11, 16.1, 0-0, 1h, 5s) started the season with the Bulls, went to Tampa Bay in May. Never came back. He first went on the 60-day disabled list, then was claimed off waivers by Cleveland and ended up with the Columbus Clippers. Burch Smith (R, 3, 16.1, 2-1) was a late August addition to the Bulls roster and was very helpful filling in a starting role at the end of the season. Just three starts then, but two more in the post-season. Decent stats on a very small sample. Justin Marks (L, 9, 15, 4-1, 2h) got called up by Tampa Bay in May after a decent beginning with the Bulls. But when the Rays went to send him back he got claimed by the Dodgers and spent most of the year in Oklahoma City with their AAA franchise there. Mike Broadway (R, 6, 15, 1-2) came up from Montgomery at the end of the season and also appeared in 3 postseason games. He has 12 years in professional baseball, coming back from Japan for the 2017 season. He started in the Nationals system and then came over to the Biscuits in late June. *José De León (R, 3, 12, 0-2) basically spent 2017 on the disabled list. *Jamie Shultz (R, 13, 11.2, 1-0, 4h, 1bs) was a WDBB favorite in 2016 as a starter. After just one inning in his first appearance, he went on the disabled list and did not come back to the Bulls until the end of July, as a reliever. He did OK, and also had two 1-out sessions during the playoffs. Five pitchers lent a hand either just before or during the playoffs. Jonny Venters, Chris Pike, Brandon Lawson, Nathan Eovaldi, and Xavier Cedeno. Kyle Winkler, Taylor Guerrieri, Hunter Adkins, Chase Whitley, Edwin Franco, Brad Boxberger, Danny Farquhar, Chris Pike, and Drew Smith all had a few innings during the year. 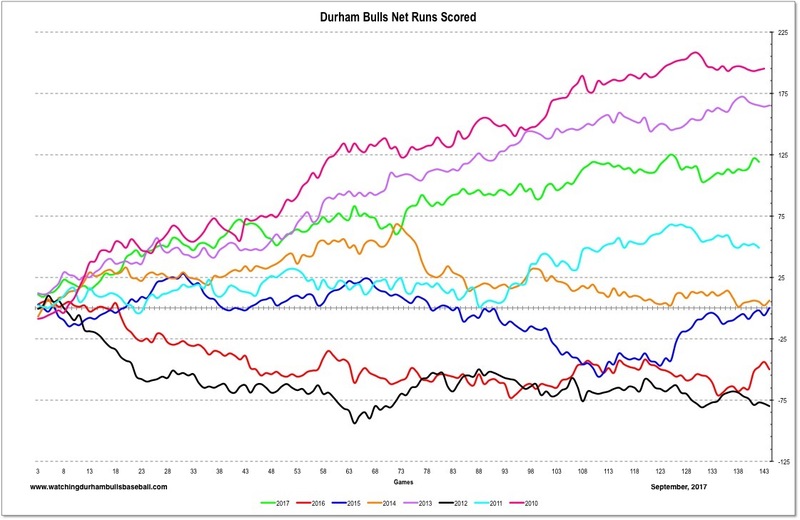 The Durham Bulls started the season winning three games in a row and never looked back. 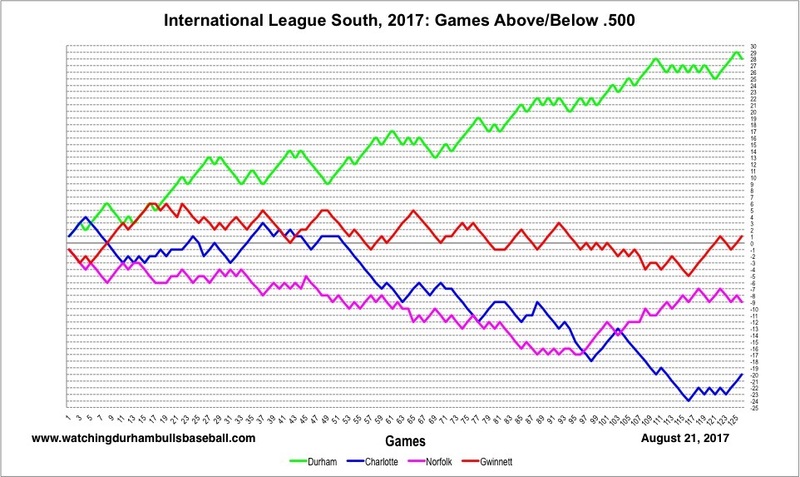 There was a moment back on April 22nd when the Gwinnett Braves were in a tie, but that was the last time the Bulls did not lead in the South Division of the International League. 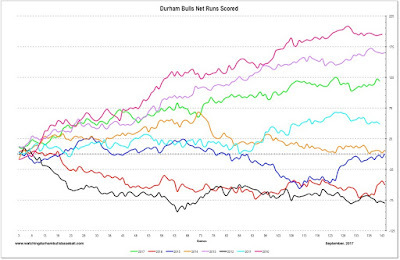 Tracking their net runs scored over the year was equally impressive, if not as much as a couple of other years. 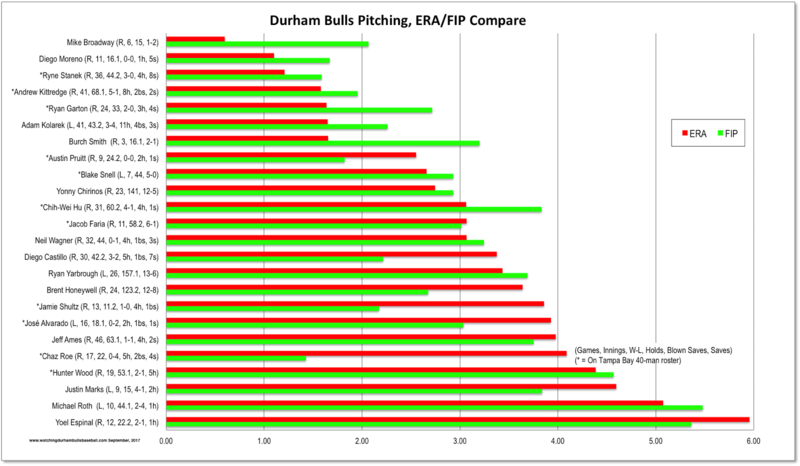 What stood out in 2017 was the Bulls' pitching staff. 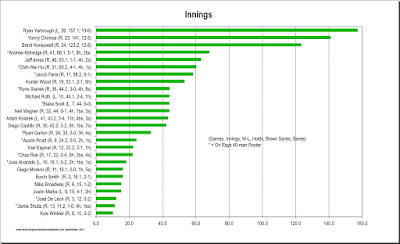 This chart shows the running ERA of the starters and relievers over the last half of the season. 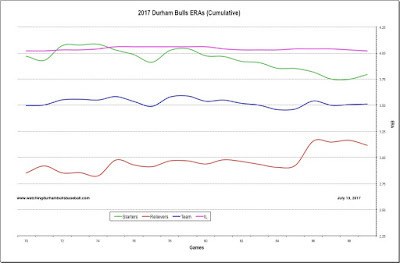 The Bulls ended the regular season with a team ERA of 3.37, just behind Scranton/Wilkes-Barre's 3.36. And a good bit better than the league average on 3.97. And just look at the relievers! Their ERA at the end of the year was just 3.13. That explains the observation that of the 15 "bullpen days" (games that were started by relief pitchers instead of starters), the Bulls won 12. 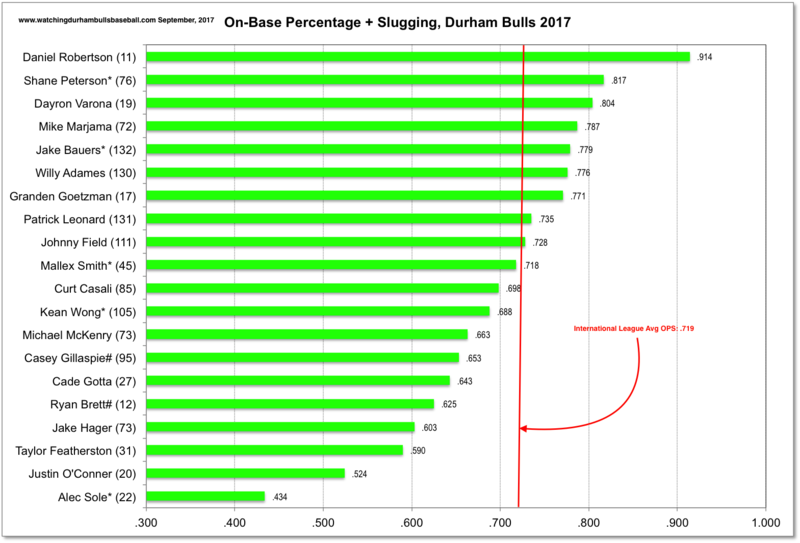 Hitting was not a strength of this year's Bulls team. They had a hitting streak going at mid-season, but they "regressed to the mean" by the end of the year. 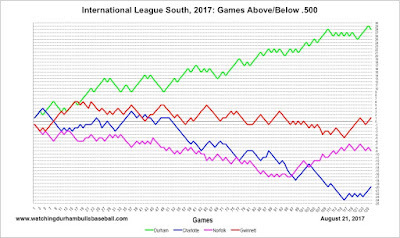 The team OPS of .719 matched the league average for the year. 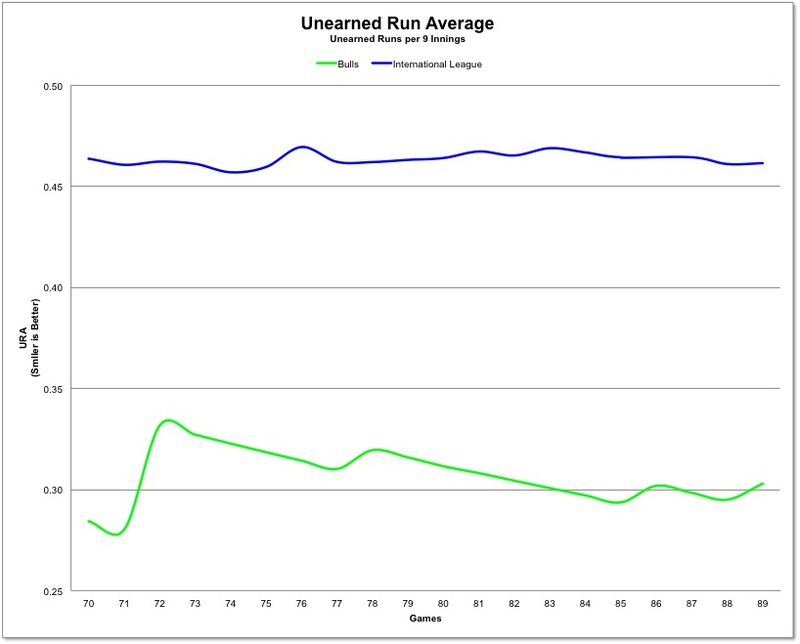 That goes a long way toward explaining the Runs Scored chart above. 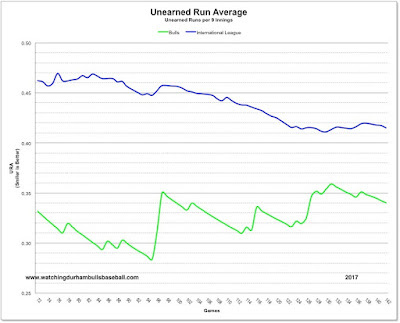 We invented a stat this year to try to get a grip on team defense, calling it the "Unearned Run Average". 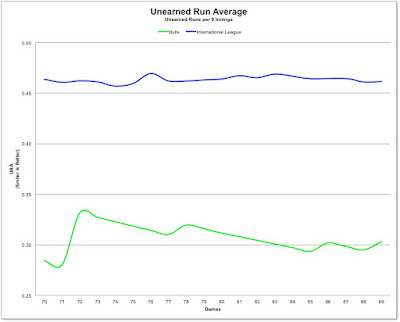 It's simply a running average of unearned runs per 9 innings and fairly easy to calculate. The Bulls were a standout this year. Errant glove work and wild pitching did not have too much of an impact on games lost this year. 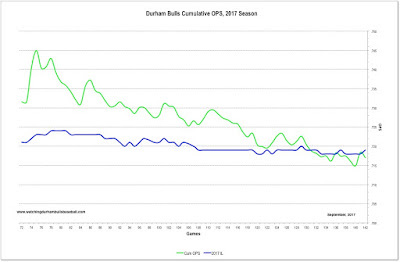 These stats do not reflect a post-season where the Bulls took three out of four in the first round, took three out of four in the second round to win the Governors' Cup, and then won the AAA National Championship. They outscored their opponents 39 to 22 and pitched two shut-outs. And who could forget a grand slam to win the AAA game! 2017 is a fine addition to the Durham Bulls history. By now you will have heard about Kean Wong's heroics and his well-deserved accolades. For example, Jeff Ames came on in the 2nd inning with the bases loaded and just one out. An Adames-Wong-Bauers double play ended the threat. Ames stayed for another inning, recorded a five-out appearance, and a season as the Bulls best middle reliever. Kean Wong could just as easily been the games' goat. He got a single in the 1st inning and then got thrown out trying to go first to third on a Willy Adames single. However, in the bottom of the 4th all was forgiven with that very pretty grand slam. Then there were two nice bits of defense as the game went on. Rehabbing Xavier Cedeno was the Bulls fourth pitcher and I was already composing a full-blown rant in my head if he had not done well. But he did a fine job inducing ground balls and stranding a runner on 2B after an error. Brent Honeywell did a fine job and got credit for the win. I'm not sure why that would be since Chi We Hu pitched the top of the 4th, Cedeno pitched the top of the 5th, and the winning run was scored in the bottom of the 4th. Maybe someone would enlighten me on that rule. Pretty day. Nice game. Wonderful end to a great year for our Bulls. The St Louis Cardinals AAA team, the Memphis Redbirds won the Pacific Coast League championship (story here). So they are going to show up for tomorrow's AAA championship game up in Moosic, Pennsylvania at the home field of the Scranton/Wilkes-Barre RailRiders, the place where the Bulls just won the International League Governors' Cup. Just to establish a modest amount of credibility up front — the idea of a one-game "national championship" makes no sense at all. That said, if the Bulls win, I'll wear the T-shirt. These numbers are the end-of-season stats for the Bulls and the Redbirds. The teams are pretty close, but the Memphis crew has a substantial edge in hitting, while the Bulls pitching looks pretty good. But that's at the end of the season. Now both teams have two rounds of playoffs behind them and they both won their championship in hostile territory. Which starting pitcher will do best after the longest rest period either of them will have had all year? Same goes for the relievers. Are any of the players looking for a call-up? The Cardinals are 4½ back in the NL wild card; the Rays are 5½ back. Maybe not. The Bulls have been hanging out in Scranton for several days; perhaps taking bp and working out every day. The Redbirds possibly went back to Memphis enroute to Moosic. Which manager will make the best calls and the best moments? For us, we all need to hope that the TV broadcast crew is better than the last time. For that game, they went off into off-topic story-telling and completely ignored events on the field. Have not heard if Patrick Kinas will be broadcasting on the radio. Hope so. If he does, that will be the place to find out how these teams match up. By the way, back in 2009 the Bulls played this same team for the AAA National Championship. And we wrote about it. The Bulls won. In the 11th inning. Check out the box score for a trip down memory lane. Elliot Johnson, Justin Ruggiano, Ray Olmedo, Joe Dillon, Desmond Jennings, Jeremy Hellickson, Joe Bateman, Mitch Talbot. Quite a crew. At the beginning it looked like the Bulls were going to run away with this game, but the RailRiders kept coming back. In the end, however, the Bulls prevailed. This is a very good team and I want to thank them for all the thrills they've given us this year. It's been a lot of fun. I would be remiss if, in WDBB tradition, if I didn't point out a few oddities of this last game. The pitching crew was not (mostly) the crew that got the Bulls into the playoffs. Starting pitcher, Burch Smith, only had three regular season appearances for the Bulls and had pitched just 16⅓ innings. He was followed by Adam Kolarek, who was an exception. Kolarek had 41 regular season appearances with the Bulls for 43⅔ innings. He had three post-season appearances. Hunter Wood was also an exception. Wood made 19 regular season appearances (including 6 starts) for 53⅓ innings. In post-season he had 3 appearances and got the win last night. Jonny Venters had 1 appearance for 1 inning in the regular season, but 3 in the post-season. Mike Broadway had 6 appearances for 15 innings in the regular season and 3 post-season appearances. Diego Casillo, who got the save, came up in June and was a stalwart of the regular season with 30 appearances for 42⅔ innings. He had three appearances with 2 saves in the post-season. On the other hand, the offense were mostly team regulars. Daniel Robertson, who got the big hits of the night (4 RBI) was an exception since he only had 11 regular season games (but he had 116 in 2016). Kean Wong, Jake Bauers (who got the Governors' Cup MVP award), Shane Peterson, and Justin O'Conner all got hits and scored runs. My understanding is that the Bulls are going to hang out in the Scranton/Wilkes-Barre area until Tuesday, waiting for the winner of the Pacific Coast League Championship to show up for the Triple-A National Championship game to show up. Note: 2017 Governors' Cup T-Shirts are in the Ballpark store. Brent Honeywell looked really, really good (even when his infield got sloppy), Shane Peterson crushed one over the center field wall, Patrick Leonard made a perfect throw from left field to home (video at the MiLB link), and the Bulls are one game away from the Governors' Cup. Memphis won in extra innings and is heading to El Paso with a 2-0 lead in the PCL Championship. Whoever plays in the "Triple-A National Championship" to be held in Moosic next week can only hope that the TV crew gets a serious upgrade. Guess we are spoiled by the quality of the setup at the DBAP, but the folks up there need some help to improve the shot angles, on-screen graphics, and more. I think I heard Patrick Kinas say that if the Bulls win, they are just going to stay up in Pennsylvania until Tuesday's game. Ryan Yarborough's shaky start redeemed by double play and the Bulls never looked back. I suppose you could complain about the Rays dumping two (count 'em, TWO!) rehabbing pitchers into the Bulls lineup in a playoff game. But Nathan Eovaldi and Xavier Cedeno weren't why the Bulls lost the second game. The Bulls lost to an exceptional pitching performance by the RailRiders Domingo German who only allowed one hit of seven innings. I've made a bit of fun about how the Scranton/Wilkes-Barre RailRiders do not play in either Scranton or Wilkes-Barre. They play in Moosic. Here's why and it actually makes a bit of sense (even if the name of the team does not). Click "view larger map" for context. Meanwhile, over in Memphis the Redbirds won against the Chihuahuas 6 to 4. That would be the St Louis Cardinals AAA team the Memphis Redbirds and the San Diego Padres AAA team the El Paso Chihuahuas. Weather is giving the PCL championships fits, so they play at noon today and head off to El Paso. This is the matchup that seemed to be coming all year. The RailRiders went through the season with an exceptional won-loss record, although they stumbled just a little bit near the end. 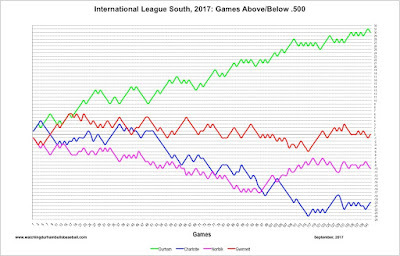 Nevertheless, they ended the year leading the entire International League in almost every statistical category. 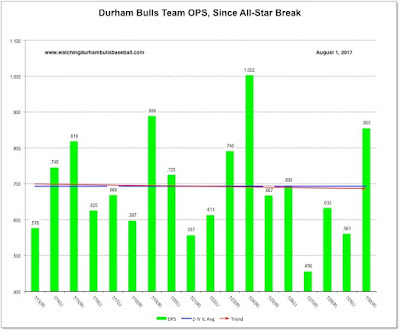 The Bulls played the RailRiders seven times this year, all in August. In the four games at the DPAC, the Bulls split 2-2. Up in Moosic (the Scranton/Wilks-Barre team plays in neither Scranton nor Wilkes-Barre), the Bulls won 2 of 3. In other words, they are 4-3 on the season. The RailRiders are the defending Governors' Cup champions, which might give them a slight edge. The biggest intangibles are the impact of September transactions, management skills, sheer luck ... and IRMA, whose impact may delay things tomorrow. Bulls are working out today. Game time tomorrow is 6:35. Here's the hit that won Saturday's game. 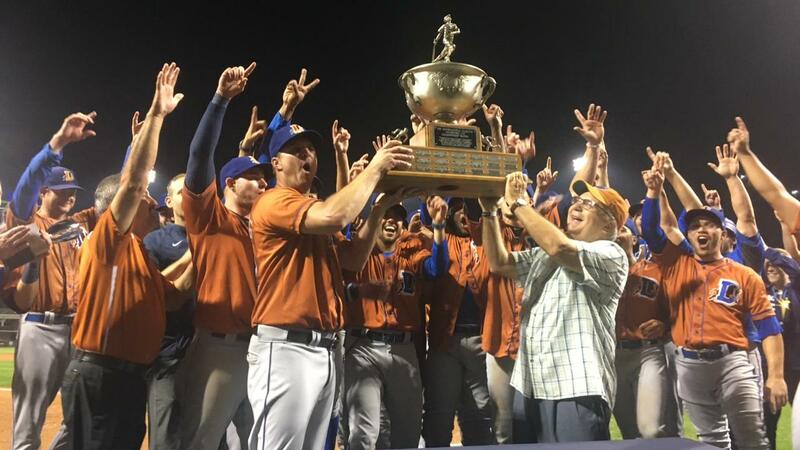 The Bulls won game 4 to win the first round of the International League Governors' Cup series. Now they come home to face either the Scranton/Wilkes-Barre RailRiders or the Lehigh Valley IronPigs (SWB leads 2-1). Durham relievers made all the difference after Justin O'Conner's single drove in two runs in the 8th. Hunter Wood got the first out of the 8th; Adam Kolarek got the second; Diego Castillo got the third. Then Castillo went on to get the save in the 9th. We haven't seen a "wrap" from the Bulls this morning, but listening to parts of the game it was clear that the Indian's pitching was dominant. I have to say that I was a bit puzzled by Sandberg's use of two pitchers in the 6th inning, followed by letting newcomer Brandon Lawson twist in the wind through the 7th and 8th. Another difference last night was some minor roster shuffling with Jake Hager playing at 2B and Michael McKenry catching. Brent Honeywell is scheduled to start tonight. He has not pitched since Sep 3 when he put in a fine outing down at Gwinnett. So he should be rested. They are tied 1-1 now and move to Moosic, PA to wind up their series. If you're a baseball fan, especially if you're a Bulls' fan, and you missed last night's game, too bad. It was a terrific one. We saw two very good young pitchers. One of them, Indianapolis' Tyler Glasnow, was in top form. When Willy Adames came to bat in the 1st inning Glaznow threw four pitches: 97, 97, 98, and 99 mph. Adames rolled a grounder to 1B for an out. The other pitcher, Durham's Yonny Chirinos, wasn't quite as sharp and he gave up 7 hits over his 7 innings. However, almost every ball hit off him was a ground ball, and the infield backed him up with three very pretty double plays. Then we got to watch Jake Bauers at bat and on the field. He took Glasnow's first pitch of the 2nd inning and put it over the centerfield wall. His 8th inning single drove in Durham's second run. And his glove work was amazing, especially his inning-ending grab and toss to the pitcher to end the 8th. Plus I have to mention how great it is to be at a game where the stands are filled with nothing but baseball fans (OK, maybe a couple came for the all-you-can-eat come on and fireworks). I've not been to a game this year where the fans were more into the game than this one. And knowledgable. Boy, was it fun. I watched the 9th from the right field stands and even those few folks were jumping and cheering as Diego Castillo struck out the side to get the save. The rest of the lineup had seen a good bit of playing time with the Bulls this year. One of them, Daniel Robertson, we saw a lot of last year. Even though Indy's pitcher looked awful in the first inning, the game was tight with the Indians coming back with solo home runs in 3rd and 4th. But in the 5th the Bulls started off with two singles and a 2-RBI double. Four runs and seven batters later the Bulls had put up a total of 6 runs and had the game in hand. Other than the two dingers, 2017 stalwart Ryan Yarborough was terrific. Here's hoping he gets a call-up — after the playoffs are done. I'd like to see him pitch one more game. The game started with a 1-hour delay and the 9th was played in an absolute deluge. Meanwhile, up Allentown the RailRiders-IronPigs game was postponed due to rain. Good article on roster turmoil on both teams in the Morning Call. Can't close without noting that none of the local media appear to have covered the game. Not one TV station or newspaper that I've come across. Shame on them! The Bulls wrapped up a great season down at Gwinnett yesterday and have a day off before their first round playoff game against the Indianapolis Indians tomorrow. First pitch: 6:35. Statistically, these two teams are a wash in essentially everything but the won-loss column and, probably, the performance of their bullpens. We'd expect the Bulls to have a better bullpen. 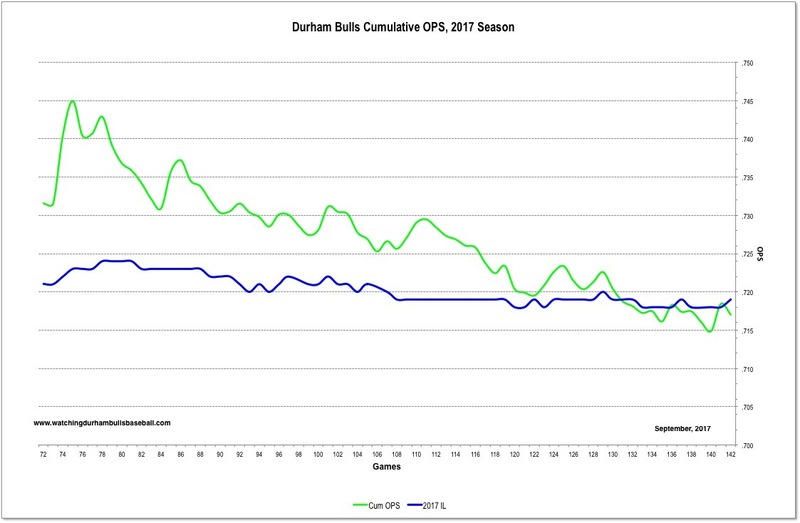 On the other hand, the Bulls offensive performance since mid-season has been nothing special. Recent days: The Bulls are 9-6 over the last 15 games; the Indians are 9-6 over the last 15 games. 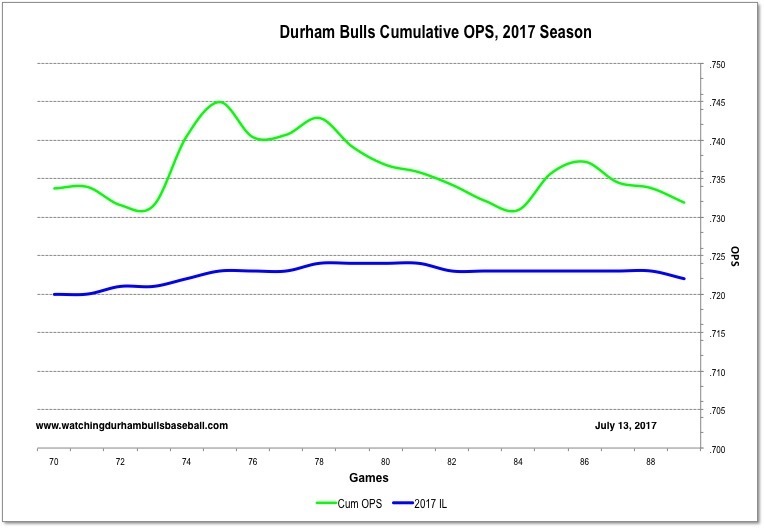 It may come down to call-ups and in that regard, the Bulls' relief pitching may be at a slight disadvantage. On the other hand, the first couple of starters are awfully good (Yarborough, Chirinos, & Honeywell). 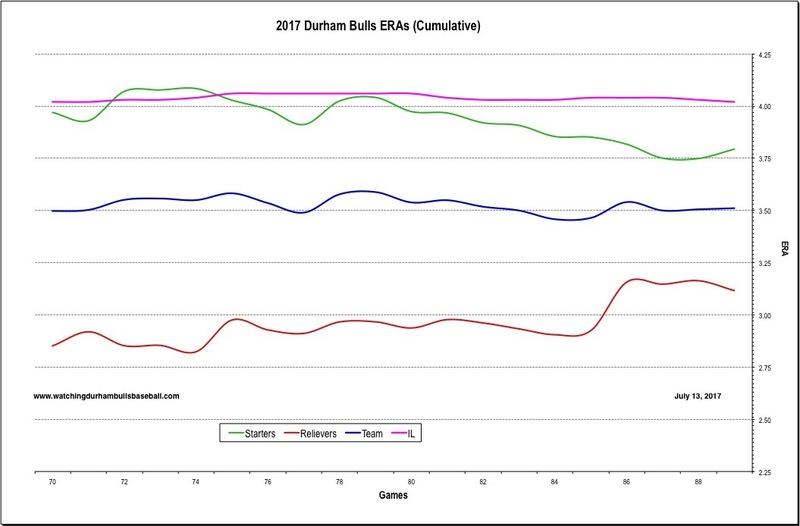 The Bulls have an edge on the season against the Indians, 6-4, and just recently won 2 out of 3 at the DBAP. Meanwhile, a shout-out to the IronPigs who put together a 6-game winning streak to grab the wild card slot on the last day of the regular season! They get to play Scranton/Wilkes-Barre in the first round, the same team they've played for their last four regular season games (and they won them all). Well, they did it. 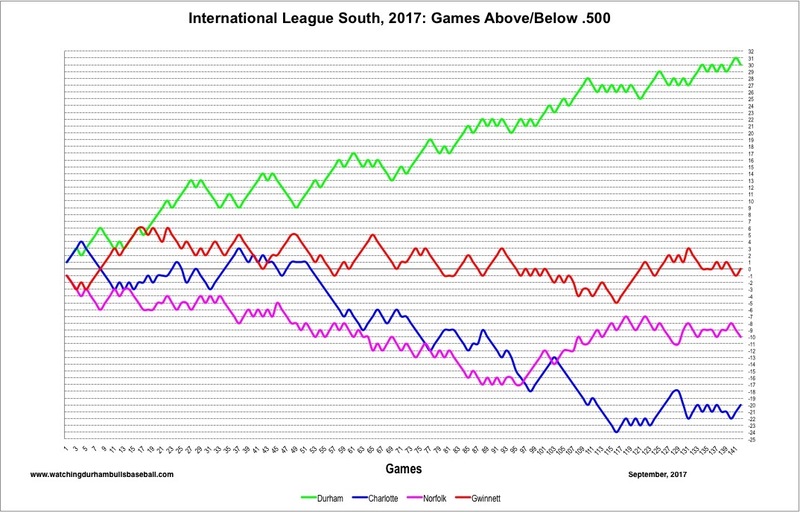 The Bulls won the South Division in a very odd fashion, but it was won last night about as early in the season as I can recall. The oddity was that not one of the runs was scored on a hit. In the 8th Johnny Field drew a walk and went to 2B on a wild pitch. Kean Wong walked. Pinch-hitting Shane Peterson faced a new pitcher and grounded out, but Wong and Field moved up a base. Justin O'Conner was hit by a pitch (bases now loaded). Mallex Smith walked (Field scored), Jake Bauers walked (Wong scored). Patrick Leonard walked (O'Conner scored). And that was enough. The Bulls celebrated on the field, and that was a grand and good departure from past practice. I can't tell you how annoyed I was the when the Bulls won a championship at home a while back and then disappeared into the dugout to celebrate in the locker room. This time we got to cheer with them and watch on TV. Thanks! The Bulls are a good team this year. 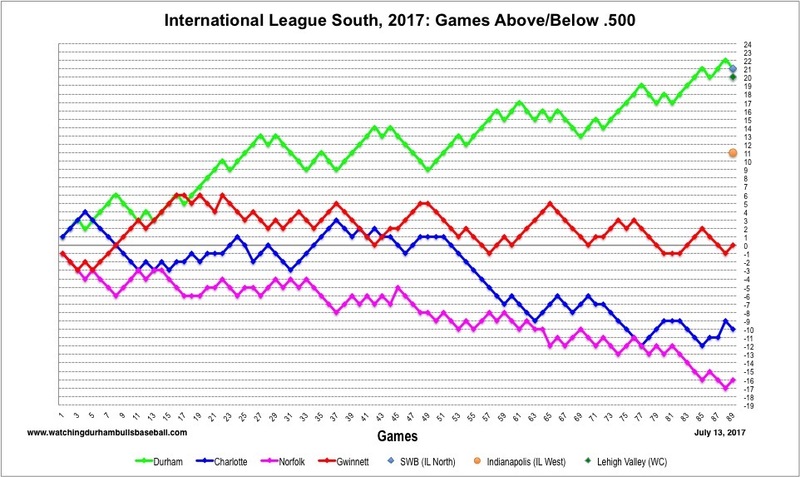 The South Division is not as strong as it has been in the past, but clearly the Bulls could have held their own in any of the IL's divisions. How big a deal is this? Very. 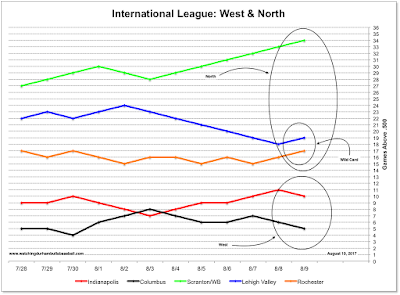 I contend that for Triple-A baseball it's the division win that matters. Very often by the time a team gets to the play-offs the September call-ups have occurred and very often the Governors' Cup is decided on two factors: the management/coaching crew and the quality of players the Double-A franchise. That is, the guys who play in the championships aren't necessarily the guys that got you there. So, again, this is a big deal. Congrats to the Bulls! Note: the Herald-Sun is reporting that Michael Roth's finger was broken on that come-backer in the 4th. Here's hoping that's not correct and he makes it back to the mound this year. 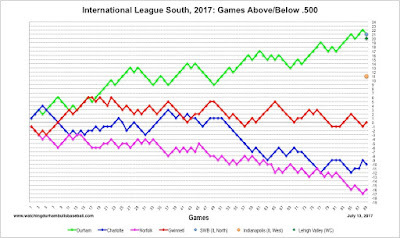 The Bulls come back 13½ games ahead of Gwinnett and only a few games away from clinching a South Division championship. What's left to play for in these last seven home games against Gwinnett and Norfolk and the seven away games against Charlotte and Gwinnett? Well, there's September. September is the month that players on the major league 40-man roster have a shot at getting called up. 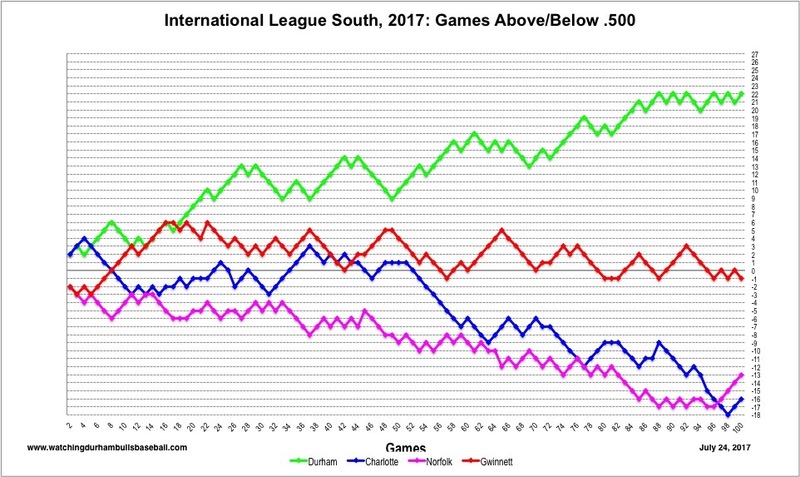 Only four Bulls position players are on the 40-man — Curt Casali, Willy Adames, Taylor Featherston, and the recently returned Mallex Smith. So those guys have at least have a shot at a call-up. As do the six pitchers on the 40-man. The unknown piece of the equation is what the Rays need or want. Hard to tell. Believe me, if they see a need, they can do some pretty tricky stuff with rosters. Mostly, I think they'd just like to win a game or two after their awful performance these last few weeks. The other event closely watched by only a couple thousand Bulls fans will be the Governors Cup. We'll write a bit more about that as it happens, meanwhile here's a chart on who might be playing whom. The first round is between the West Champion and the South Champion, and between the North Champion and the Wild Card. Just now it looks like Indianapolis in the West, but Columbus can't be counted out. 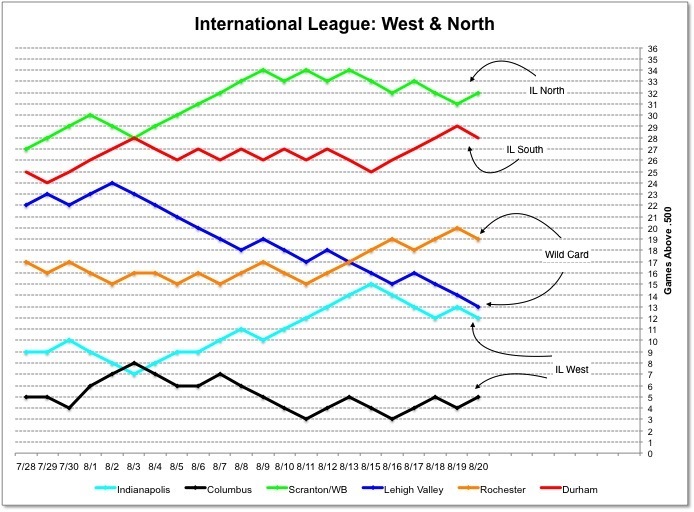 Scranton/Wilkes-Barre has a lock on the North and Lehigh Valley's long slide may have taken them out of contention for the wild card, but they remain in reach of Rochester. Standings. The first three games of this home series left a lot to be desired. 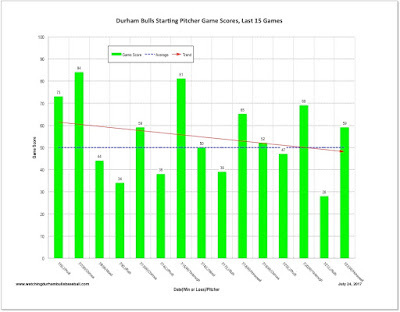 Three unearned runs last night pretty much doomed the Bulls (and there was another unearned run in the first game). One out of three to the worst team in the west isn't good. On the other hand, the Bats pitching was pretty good. But the Bulls are still cruising toward the IL South championship. 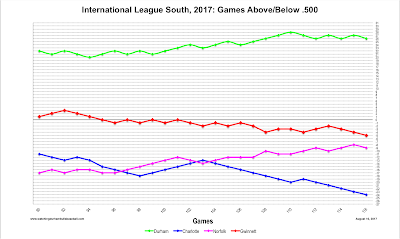 Today sees the best team in the International League visit the DBAP. The Scranton/Wilkes-Barre RailRiders (isn't that a name? ), the Triple-A team of the New York Yankees, just swept the Gwinnett Braves (thank you very much), but now the Bulls have to think to the future and the Governors' Cup. 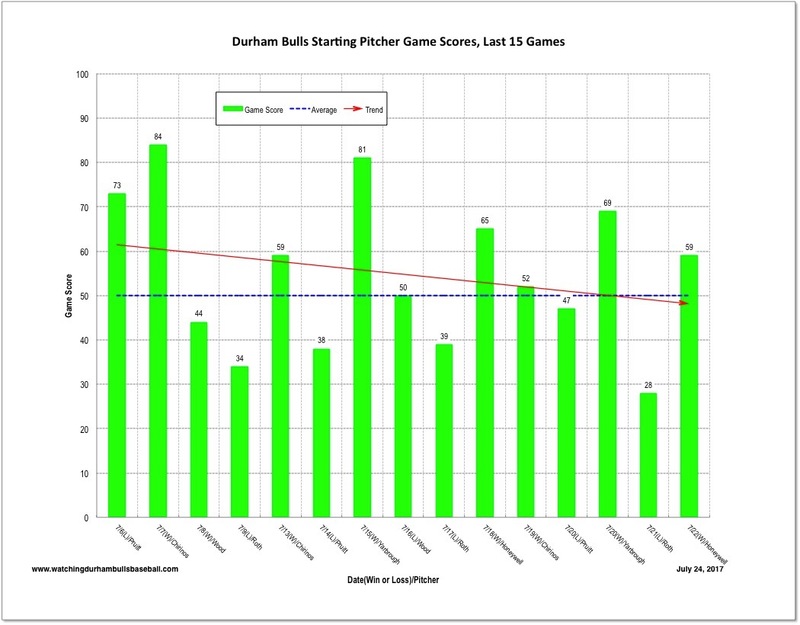 As can be seen, the RailRiders lead the Bulls in every category except defense. And the Bulls starting rotation is in a bit of turmoil for these four games. How are the races looking? 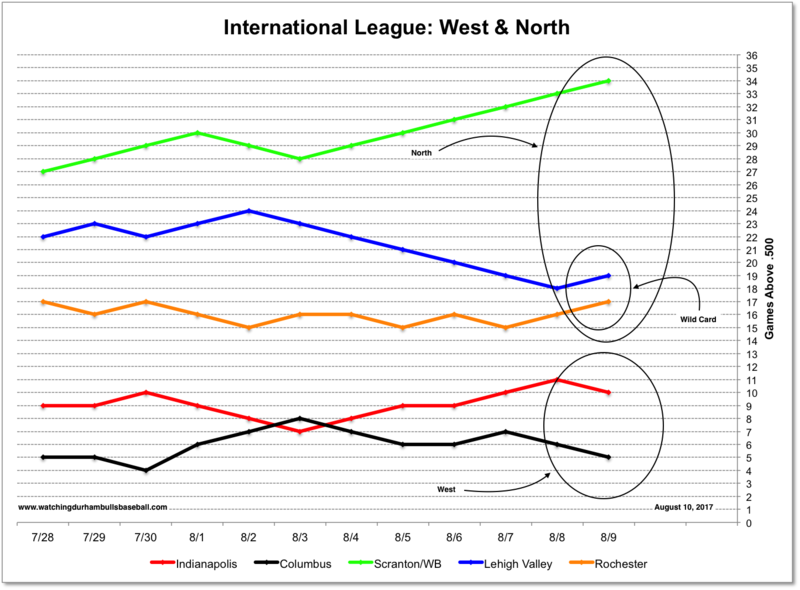 Well, Columbus obviously has a shot at winning in the West and Rochester is chasing Lehigh Valley for the wild card. August is interesting. Mike Marjama is (was), from this fan's perspective, the best catcher the Bulls have seen in a long while. His available stats are far better than either Curt Casali or Michael McKenry. So what have the Rays done? Traded him to the Mariners. What about the Bulls 4th best relief pitcher, Ryan Garton? Sigh. Traded to the Mariners. For what? or Whom? See limited discussion here and here. Speaking of the Rays, they sent former Bull, but not a particular fan favorite, Tim Beckham to Baltimore. That means that the only former Bulls on the Rays active roster (position player) are Evan Longoria—who played in just 31 games on his way up 10 years ago and has been back for a couple of rehab stints and Daniel Robertson, who put in 118 games as a Bull last year. On the DL is Kevin Kiermaier who had brief stints with Durham in 2012, 2013, and 2014 before getting his call-up. Odd set of games over in Norfolk. Two losses and a one-run win. One of the losses was yet another bullpen day. Perhaps with Blake Snell back for a while, we won't see so many of those. 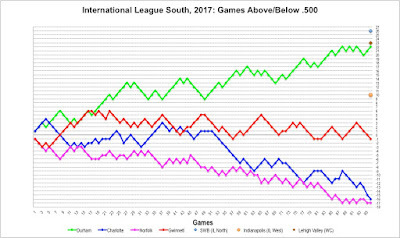 The Cincinnati Reds AAA team, the Louisville Bats are not having any better year than their parent club. 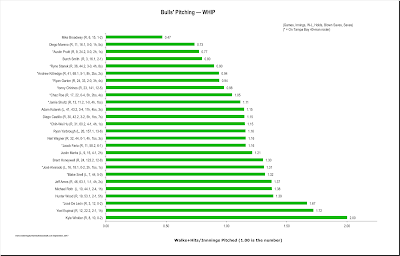 The hitting for average isn't so bad, but the pitching is not good and the fielding is awful. The big deal comes later in the week when the Scranton/Wilkes-Barre RailRiders come to town. The Bulls swept the Charlotte Knights in three well-played, well-pitched games. Meanwhile, we're thinking about the playoffs. Here's how it works: The West plays the South and the North plays the Wild Card in the first round. 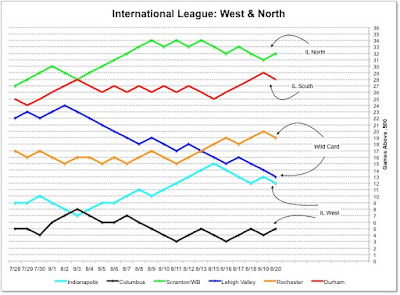 Columbus jumped into the lead over Indianapolis yesterday. And the wild card will obviously go to whomever comes in 2nd place in the North. The Bulls start a very short, 3-game, home stand tonight after a successful 5 win, 2 loss road trip. 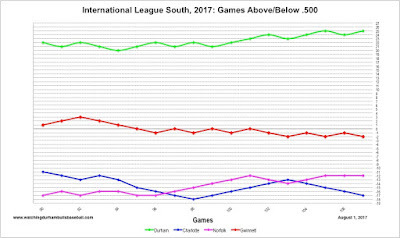 They return solidly in first place in the South Division, 14 games ahead of the 2nd place Gwinnett Braves. Two of the road games were "bullpen games". That is, the Bulls used only relievers in the games. That's something of a pattern for 2017. This year the Bulls have had 9 bullpen games, and won 7 of them. On the field, the biggest change was the result of the Rays trading Casey Gillaspie to the White Sox. That's meant that Jake Bauers has been playing a lot of first base (the last five games). It also means that we might be seeing Gillaspie on the field in a Knights uniform tonight. To fill the Gillaspie spot a young infielder, 24-year-old Grant Kay, was called up from Montgomery for his AAA debut. He's done very well, hitting .455 in 11 ABs, stolen 4 bases, and committed no errors in 3 games at 3B. 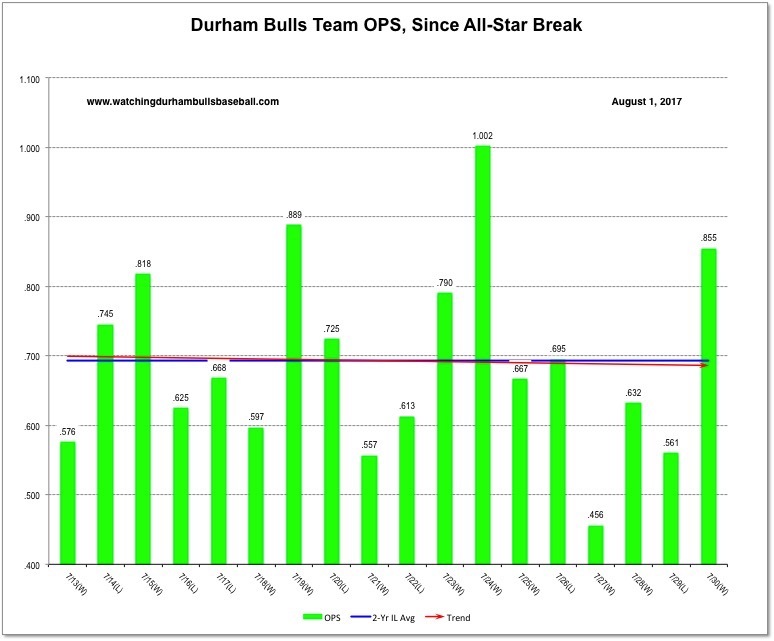 Overall, the Bulls' bats are not particularly hot since the All-Star break, but they are doing OK.
Charlotte, currently in last place, is in town for the next three games. As can be seen, their problem is pitching and fielding. Their hitting is pretty good. The Bulls took 3 of 4 up in Buffalo and are moving on to a re-match with the Lehigh Valley IronPigs. Four decent games, including a solid outing by new guy Michael Roth. That's going to be important since roster turmoil is surely going to get worse before it gets better (if it ever gets better). The big news is that Casey Gillaspie has been traded to the White Sox for a pitcher who has gone on the Rays 25-man. Gillaspie was assigned to Charlotte by the White Sox, so the Bulls will be seeing him in the Knights' dugout next Tuesday. I'm guessing that the change in uniform will help him regain his stroke and that could mean trouble for Bulls' pitchers next week. After a tough 2017, we can only wish Mr. Gillaspie well. We've enjoyed watching him at 1B. In other news, Jamie Schultz, last seen in a Bulls uniform for one inning in the second game of the year, April 7th, is back from the disabled list. Meanwhile, the IronPigs split a four-game series with the Gwinnett Braves since last the Bulls saw them. They are just 1-1/2 games back in the North Division and hold a 3-1/2 game lead in the IL wild card race. The Phillies have been shuffling the IronPigs roster at least as much as the Rays have been shuffling the Bulls roster. Not a bad home stand, 4 wins and 3 losses against very good teams. Since one pitcher, new guy Michael Roth accounted for 2 of the 3 losses, we can (as is our wont) blame the quality of the Tampa Bay scouting team for some of the Bulls' troubles. And it really does seem as if starting pitching tells a lot of the story for this stand as the starting crew got 4 above average Game Scores in all four wins, and the below average scores for all three losses. But, there was the oddity last night of the Iron Pigs breaking the tie of a Bulls wild pitch that let a batter get on base after a strike out (and eventually score) and a walk-off after an IronPigs wild pitch let a runner get to third base and then score on an infield single. 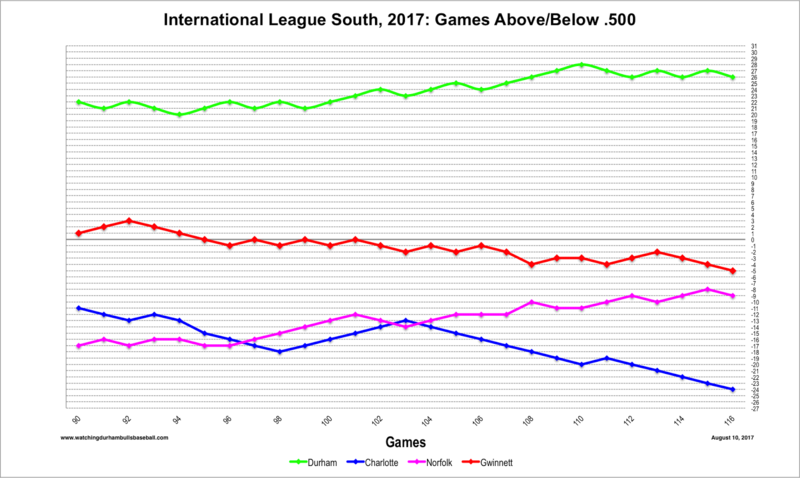 Nevertheless, the Bulls still have a big lead in the South Division. The Bulls are off to Buffalo for four games, then to the IronPigs home for three games. The Bisons are having a tough year, but, as we've seen, the IronPigs are a very, very good team. 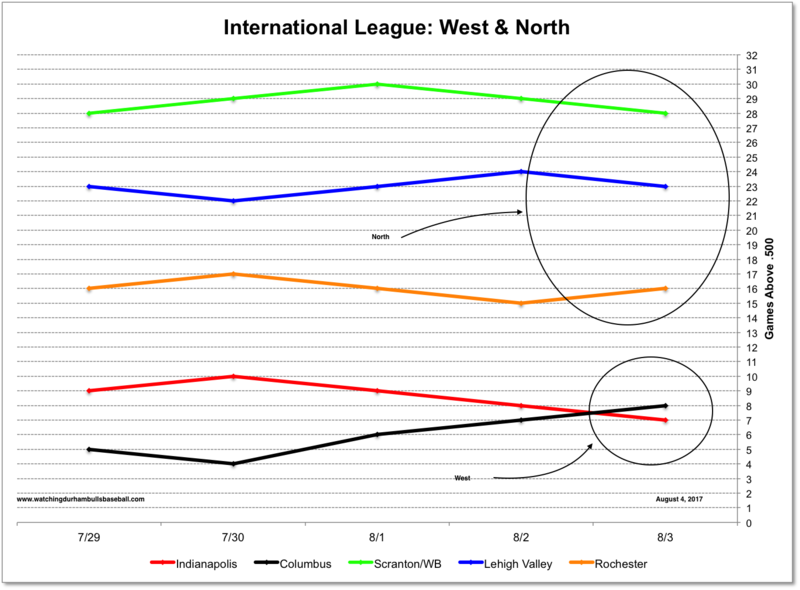 The Bulls did a fine job against the leading team in the IL West, the Indianapolis Indians, taking 2 out of 3 games. 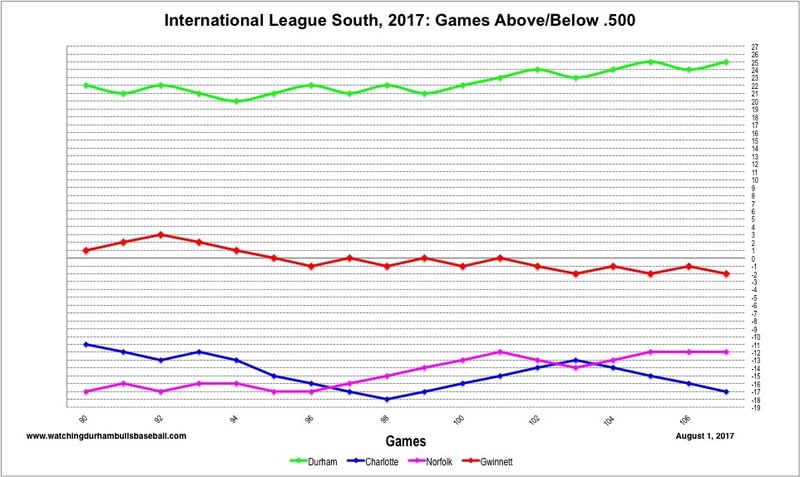 And they stayed well on top of the IL South. But today they come up against a rarity for 2017 — a team with a better won-loss record than themselves. The Lehigh Valley IronPigs are the Phillies' AAA franchise and they have been having a great year. 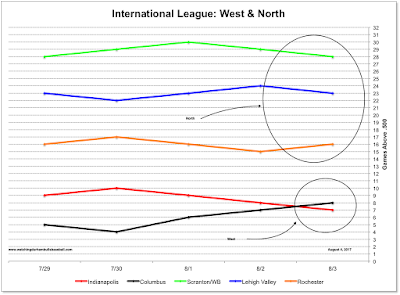 They come to town having won 6 of their last 7 games, and firmly back in contention for the IL North leadership. About the only area where there's much of a gap between the two teams is in defensive performance. The All-Star break ends for the Bull over in Norfolk tonight. By the way, the PCL won the All-Star game 6-4. Bulls players did pretty well. Box. Patrick Leonard at 3B drew two walks; Willy Adames, at short, was 2 for 3, with a home run; and Mike Marjama started at catcher, but was 0 for 2. They are solidly in first place in the IL, 21 games over .500 and 10.5 games ahead of second place Gwinnett. 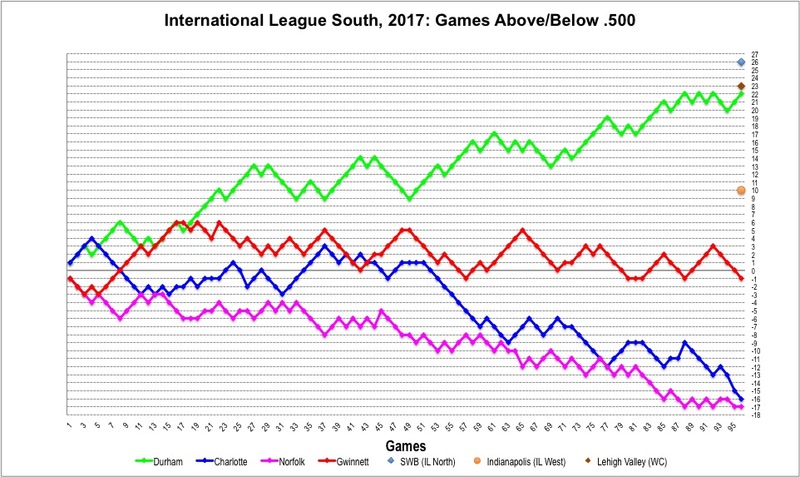 The Bulls ERA ranks third in the IL, but they are much better than the league average and the relievers have simply been doing a superb job. Note the blip among the relievers is entirely the result of one very bad inning a couple of days ago. 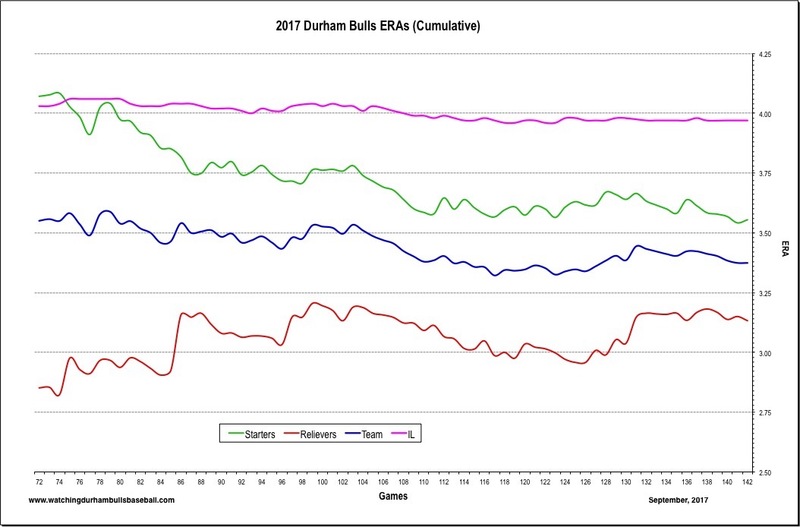 Overall, the Bulls rank 6th in the IL in OPS, well behind Scranton/WB's .787. But they are doing OK. 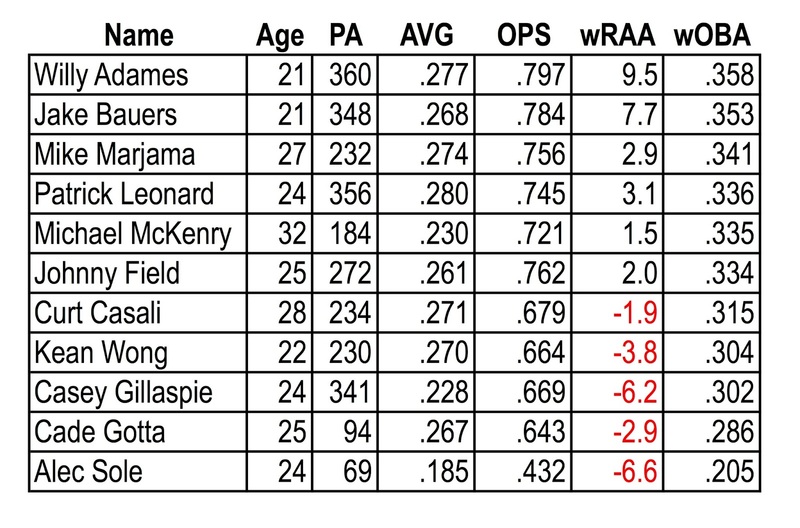 The interesting feature of this table is how much Willy Adames has improved his numbers as the year has gone by. Another player worth point ing out is Mike Marjama. Have the Rays finally produced a hitting catcher? 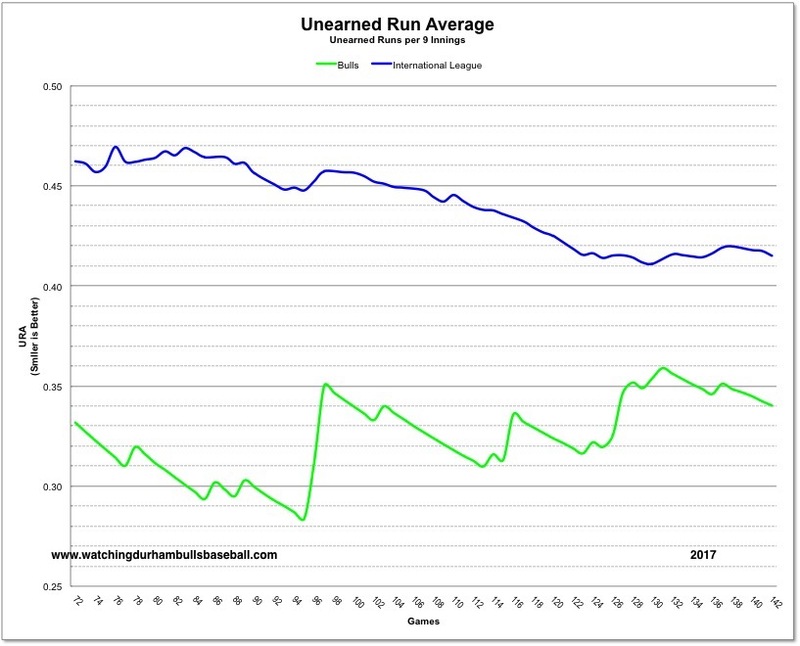 Here's our home-grown measure of defensive play — the Unearned Run Average. That is, how many unearned runs per 9 innings. 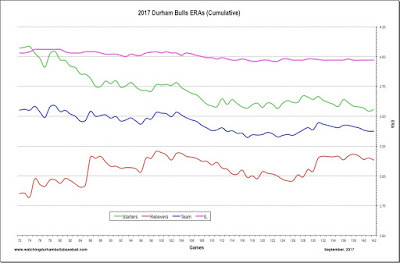 As can be seen, letting in an unearned run is a pretty rare event this year for the Bulls, a very good thing.